Machining – Sierra Lobo, Inc.
Sierra Lobo has extensive experience designing and building complex R&D hardware including demonstrated capability for building aerospace flight hardware for major aerospace corporations. We are currently developing hardware for the Next Generation Launch Technology Program including state of the art cryogenic systems, instrumentation, and electronics; all in a dynamic, concurrent engineering environment requiring close interface between our engineers, technicians, and other technical organizations. Sierra Lobo has a highly skilled, multi-disciplined technical workforce to perform in-house, as well as on-site, customer machining services. 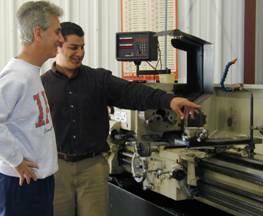 All of our machines are calibrated with certified measurement and inspection tools. We also have the ability to bring additional manufacturing capability rapidly through an extensive network of highly qualified and specialized subcontractors.